Below the fold is a long and boring essay on unpaid internships. I've been noticing some talk of a crackdown on low or no wage internships. Apparently they are illegal at for-profit firms. Articles such as this one defend the crackdown alternately with the allegations either that some interns are tricked into doing menial tasks that don't provide them with meaningful training or that poor kids have financial needs that prevent them from being able to accept unpaid internships, and thus the internships are unfair. Oddly, these two complaints are directly contradictory. Even if they weren't, they would both individually fail as reasons. The first complaint of internships that don't provide the promised training would be covered by more general contract law, and the second complaint would be an argument against all education. We'd certainly have to shut down the Ivy League, for a start. And neither complaint would have anything to do with whether the employer was for-profit. There are many Congressional and not-for-profit interns who are making coffee and running errands and who only got their internships through their parents' political connections. Tellingly, those internships are in little danger of being banned. We could make the same arguments about internships with the identities flipped. We could argue that unpaid internships should be banned because many interns come to the job unprepared or unwilling to do the work or simply don't show up at all. We could argue that low status firms are unable to attract the best interns, and therefore suffer unfair exclusion. A couple of lawyers hanging a shingle out to start a practice after graduating from a local state college are going to have little chance of snagging the governor's son who just graduated from the top of the class at Harvard. Their lack of status will be a real struggle for them, and the inability to get top performers out of the best schools will be part of that struggle. If I argued that internships should be banned in order to protect the employers, I would sound absurd. It would be absurd. If it's not absurd, then we should ban all voluntary economic activity of any kind, as the problem extends far beyond internships. The law looks to me like it is an unfortunate product of identity politics. The issue got me to thinking about notions about fair payments in general. There is probably a lot to be said about the labor theory of value or the notion of a just price, both of which have the ends of their pinky toes grounded in reality, but tend to manifest themselves in broad ethical overreach. But, news about unpaid internships got me to thinking about the relevance, or lack of relevance of the "unpaid" part. All transactions consist of a basket of pecuniary and non-pecuniary costs and benefits. These might include the level of skill or investment required to perform the transaction, skills gained while performing it, protections or insurance it provides, the implied liabilities arising from each party's legal protections, etc. Because money is universal and fungible, the cost of the transaction in monetary terms can be considered the final measure of all of these other factors. If one party receives fewer of the pecuniary and non-pecuniary benefits of the transaction, then the contractual monetary value of the transaction will be settled in their favor as a balance against all of the other factors. For many financial or corporate transactions, the payment is not reliably in one direction. Contract labor reliably leads to payment to the contractor, at least in gross terms. Insurance reliably calls for a monetary premium. But many transactions are not clearly on one side or the other. Practically every self-employed person completes contracts at a loss from time to time, or works for months or years at below minimum wage or even at a loss. Fixed income instruments tend to receive monetary income, however they do experience defaults. And recently, in inflation protected bonds, we have seen a period of time where some bondholders do actually pay the bond issuer. Futures contracts account for the cost of money, the cost to store the asset, the expected income of the underlying asset, etc. These factors do not reliably add up to a positive or negative value, so futures contracts can result in payments going in either direction. Economist Michael Munger has an interesting story about beekeepers and apple orchards. In the market for bees pollinating orchards, payments can go in either direction, depending on the supply and demand for nectar and honey. Because of the lack of certainty in these areas, in the capital/corporate realm, the notion that $0 is an important number is less important, and we don't tend to create categories from which to make moral judgments about just prices. Most transactions from the point of view of individuals and laborers have a monetary value that falls consistently on the same side of the transaction. Laborers almost always earn money from their contracts. Consumers almost always pay money for goods and services. Because of this tendency, we tend to make categories for transactions. For transactions that are job or career related, which usually include some amount of work, some accumulation of skill, and any number of other subtle combinations of benefits and costs, we call transactions which are mostly concerned with training or learning "school", and we expect the laborer to pay. For transactions where the work involves some production for the buyer, we expect the laborer to receive money and we call it a "job". But, even in the realm of individuals, there are contracts where the net monetary benefits don't fall clearly in favor of one party. Work study arrangements or graduate student contracts could net out to a student either receiving or paying money. Cottage industries could have payment going in either direction, depending on the balance of production and consumption from the customer/salesperson. I would argue that these categories create a false sense of morality about the just level of payment for services. There are a subset of jobs where all of the non-pecuniary factors add up to a transaction where the cash payment for labor is less than the minimum wage. If we remove these arbitrary categories from our analysis, it becomes more difficult to construct a moral reaction to contracts that happen to fall on one part of the continuum versus another. When we negate these contracts, we also negate the vast number of non-pecuniary benefits that came with them. Some contracts cannot reach the new equilibrium, and jobs are lost. In others, benefits may be lost, flexibility reduced, safety decreased, pre-employment training has to replace on-the-job training, etc. In effect, to the extent that it is possible, contracts arbitrarily have to reflect a new equilibrium of non-pecuniary factors so that the monetary payment falls outside the designated range ($0 to $7.25/hour). 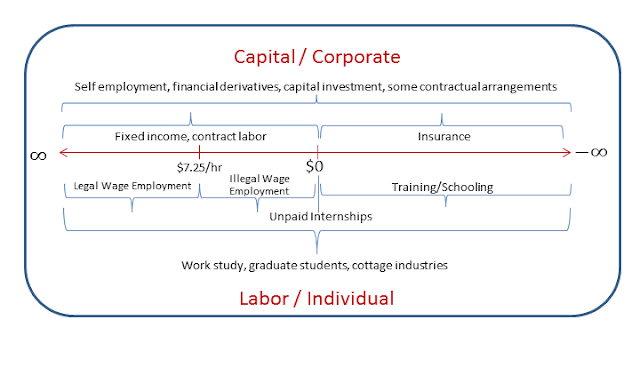 I believe minimum wages are difficult enough to justify, but given their existence, and using this paradigm of contracts with a sliding scale of training versus production, where the difference between "training/school" and a "job" is not so sharp, the addition of internships to the banned activities seems especially strange. It effectively increases the illegal range from $0<x<$7.25 to $0<=x<$7.25. If not for the arbitrary distinction of the value "$0" in our cultural construct of these activities, this change would be meaningless. It is only cultural frictions regarding the definition of work which would prevent firms from charging students $100, calling it "occupational schooling", and proceeding as before. Mr. Miyagi might be able to cleverly work around these strictures, but unfortunately for many others, mutually beneficial relationships will be forever lost due to these laws. Is this the last shoe to drop for Obamacare?